Eaton 1-Phase 3-Wire 4-jaw multiple metering residential meter stack has aluminum/copper neutral conductor of 1/0-AWG-300-KCMIL and aluminum/copper ground conductor of 14-2/0-AWG. 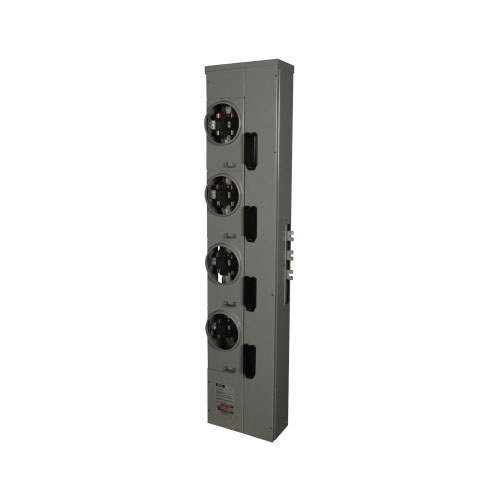 The meter stack with aluminum bus rating of 800-Amps, has a voltage rating of 120/240-Volts AC and current rating of 200-Amps. It incorporates ringless meter socket cover. The outdoor enclosures have galvanized steel construction for added durability. This meter stack features moveable phase connector, neutral assembly, enclosed horizontal bus, ground bar, raintight cap, knockouts, meter socket, wireway cover, bus connection and vertical bus bar. This meter stack measures 7.01-Inch x 13.5-Inch x 64.5-Inch. It is suitable for residential applications. The meter stack is UL listed.